It wasn't supposed to work this way. The Ukraine and Poland had been chosen to co-host the Euro 2012 football contests - a series of matches in soccer that is highly sought after among the European states for the boost of fans and visitors and the opportunity to showcase the host nations' progress. The event - sixteen nations football teams in a playoff schedule between 8 June and 1 July 2012 - was the first for either nation. The host cities Warsaw, Gdańsk, Wrocław, Poznań in Poland, and Kiev and Lviv in Ukraine are all popular tourist destinations, while two other Ukrainian cities, Donetsk and Kharkiv have a chance to shine. The responsibility of the host nations require the expansion and modernisation of roads and transport links, as well as stadium upgrades. Six of the eight venues are brand new stadiums currently being constructed ready to open in advance of the tournament; the remaining two (in Poznań and Kharkiv) have undergone major renovations to improve them. So this is a big deal, but now there is talk among leading European nations of boycotting the tournament. Ukraine's political leaders and elites have, unlike Poland, since the breakup of the Soviet Union in 1990, been unable to find common enough ground to govern with singular purpose. Perhaps the most fundamental division is that of vision. After 22 years of independence, the leadership is still stumbling over whether to orient east towards Russia and retain historic close ties with that nation, or look west and seek to build a more modern and participatory democracy in line with Western Europe. From 1990-2004, two Presidents ruled over a government coping to change from a political satellite of the Soviet Union with its resources and economy deeply oriented to serving Russia, into a more competitive, self sufficient nation within the larger European setting. But over time, corruption, power, and control became more obvious, and in 2004, the political disarray finally emerged in full display. In 2004,Viktor Yanukovych, then Prime Minister, was declared the winner of the presidential elections, which had been largely rigged, as the Supreme Court of Ukraine later ruled. The results caused a public outcry in support of the opposition candidate, Viktor Yushchenko, who challenged the outcome of the elections. 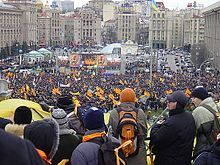 This resulted in the peaceful Orange Revolution, bringing Viktor Yushchenko and Yulia Tymoshenko to power, while casting Viktor Yanukovych in opposition. The 2004 revolution and subsequent short Presidential rule of Yushchenko was viciously challenged. Yushchenko was poisoned in an apparent assassination attempt in late 2004 having ingested hazardous amounts of TCDD: the most potent dioxin and a contaminant in Agent Orange, and suffering disfigurement as a result. Yanukovych returned to a position of power in 2006, when he became Prime Minister in the Alliance of National Unity, until snap elections in September 2007 made Tymoshenko Prime Minister again. Yanukovych was elected President in 2010, and this time engineered a criminal charge of malfeasance in office on Yulia Tymoshenko. In October of 2011, she was convicted of assorted bribery, misuse of state funds, etc, and sent to prison for a seven year prison term. In April this year, Tymoshenko began a hunger strike accusing the state of poor treatment and beatings, which eventually forced the attention of European leaders. A German doctor was brought in and is now in charge of her convalescence, but on the political front, the trial itself along with the prison treatment brought about several European leaders saying they should and would boycott the Euro 2012 tournament. So here we are! Football, boycotts, revolving door leadership - all after two decades of trying to move the country forward. Since the dissolution of the Soviet Union, Ukraine continues to maintain the second largest military in Europe, after that of Russia. The country is home to 46 million people, 77.8 percent of whom are ethnic Ukrainians, with sizable minorities of Russians (17%), Belarusians and Romanians. The Ukrainian language is the official language in Ukraine. Russian is also widely spoken. The dominant religion in the country is Eastern Orthodox Christianity, which has heavily influenced Ukrainian architecture, literature and music. There are some amazing Communist era statues and memorials, as shown here, highlighting differences in vision that still bedevil the country.